It is important to understand that while NF is rare, it is statistically unlikely to have more than one form of NF. It is also statistically likely for a person with any of the three types to be told they might have more than one type of NF. Since tumor growth for each is different, it is important to know for a fact which type a person has. Due to similarities between the three forms, the accidental diagnosis of more than one form of NF is an easy one for doctors to make. 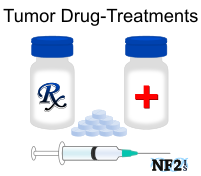 All three forms of NF can result in tumors that may be seen as bumps just below the surface of the skin, cutaneous and subcutaneous tumors. 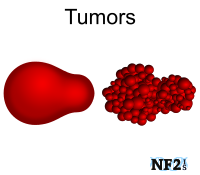 In a person with NF1, these tumors are neurofibroma. 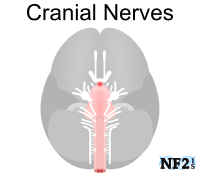 In people with NF2 or Schwannomatosis, they would be schwannoma. 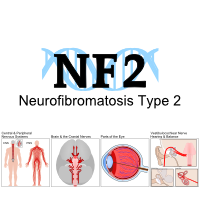 It is argued by some doctors, that it is possible for neurofibroma to also grow in individuals with NF2. The distinction between the Neurofibroma and Schwannoma can only be determined by a biopsy but cannot with the use of an MRI alone. Some of these tumors are painful, some are not, and there is typically a considerable amount more of skin surface tumors for people with NF1. Skin discoloration spots of café-au-lait macules is also primarily an NF1 concern, but people with NF2 and SWN, sometimes developing these, typically fewer than 6. 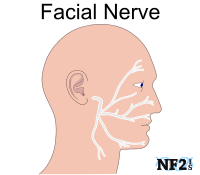 These marks are not part of diagnosis criteria for NF2, or SWN. 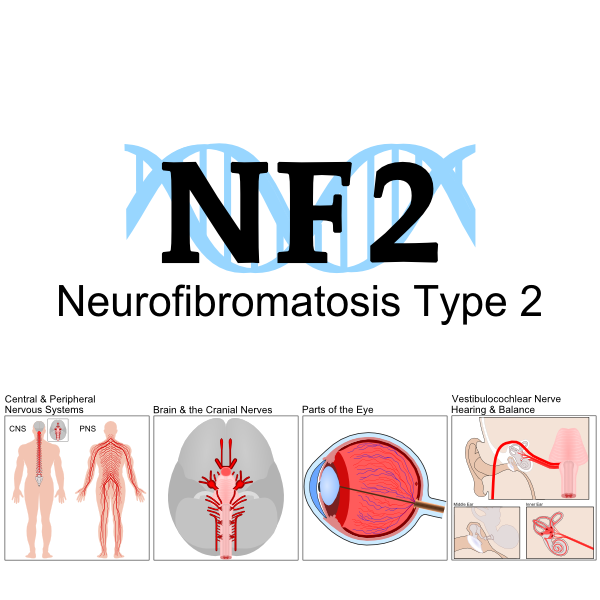 There have been different standards for diagnosis of NF2 since it was acknowledged as a condition different from NF1 and again when Schwannomatosis was classified as a separate condition. 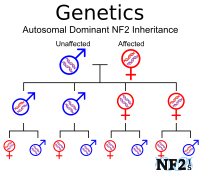 In 2003 it was determined that NF1 was caused by damage to Chromosome 17q11.2 and can be found there in genetic testing. 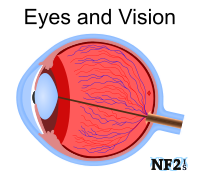 A percentage of individuals with NF2 were displaying symptoms differently. In 2005 the development of genetics found out why when these individuals had a different genetic mutation. 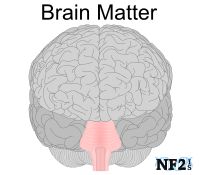 While some issues are in fact the same with individuals who have NF2, Schwannomatosis ( SWN / NF3 ) is, in fact, its own condition. Schwannomatosis is caused by a mutation in the SMARCB1 gene (SWI/SNF) or the LZTR1 gene. The diagnostic criteria for a person to be diagnosed with Schwannomatosis follow a strict guideline established by the NIH. A diagnosis for Schwannomatosis may be established if a person meets one of the conditions identified below. In 2013, individuals showing signs of Schwannomatosis with no markers for the SMARCB1 protein were finally established to have an alteration of the LZTR1 protein. These can be dark brown, or light brown, contrast areas of different skin pigmentation, and may be about 1". Often such a mild difference in skin tone they may be unnoticed or difficult to see in pictures. These can also fade over the years. No treatment is necessary. If an individual in a family has Neurofibromatosis (NF); Neurofibromatosis Type 1 (NF1), Neurofibromatosis Type 2 (NF2), or Schwannomatosis (SWN/NF3) also develop these marks, medical review of health for the same form of NF. The presence of Café-au-lait Macules (CALMs) should raise the suspicion of a genetic condition and physical examination for cause is important. Hoa, M., & Slattery III, W. H. (2012). "Neurofibromatosis 2." Otolaryngologic Clinics of North America, 45(2), 315. Cherian, Ajith, et al. "Segmental schwannomatosis: An uncommon cause of crural monoparesis." Journal of neurosciences in rural practice 3.3 (2012): 420.